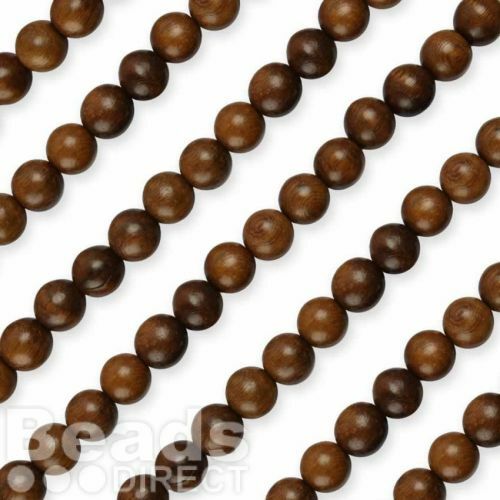 For some really exciting jewellery designs why not mix these Robles round wood beads with some of our semi precious beads. Our tiger eye beads would look lovely with these beads and as these beads are lightweight your piece will not as heavy to wear. CommentExcellent quality beads. Next day delivery. Great service. Many Thanks. CommentNice beads, smooth finish. noticeable smell of finishing product. I purchased these to make a natural wooden 'baby charm' necklace for my daughter to wear whilst feeding my grandson. I made kumihimo thread from S-lon and hole in bead was large enough for finished thread to run through. Unfortunately I washed finished item because of the smell and all the dye from the Robies beads changed the colour of everything. Also the beads became rough so be aware these beads should not be worn when swimming or washing up! I polished the beads with coconut oil and they absorbed this quite well. I'm now making another baby necklace with different materials! CommentVery happy with these beads. Nice colour.